FO Friday: Rastamouse and some Ruffley-Pinky-Goodness!!! Another looooooong week (almost) over and it would be a lie to say it's a week I'll look back on fondly - My Boy was ill at the weekend, I wasn't feeling great at the start of the week, Little Miss hasn't slept well and we are ALL exhausted today. Thankfully Fridays are so much better with a "Finished Object" or two! So this post is a little celebratory hoorah - for making it to the end in one piece and with a couple more things ticked off my list of makes. ... D was less enthused and started singing the Rastamouse theme tune when he saw it! Anyway it's been well received and already worn - not that it's been cold :) It took considerably less than half a ball so plenty left to tackle the legwarmers on my Year of Projects list. You may remember that on Wednesday I was looking for a cowl pattern. Whilst browsing Ravelry I noticed something sitting in my basket - I couldn't remember adding anything as I usually download immeditely but as soon as the link was clicked, I knew it was PERFECT for the Almerino Aran waiting to be used. It was Little Miss' turn to be my model today, but she can't keep still long enough to actually get a decent picture - so you'll see them BOTH wearing it below (unsewn-ends and all!). Another quick knit, but mainly because I couldn't put it down. Luckily the kids wanted to visit the Farm today and due to the torrential rain they played in the softplay area, leaving me to sit and knit the last three rows and start binding off - I finished it when we got home. None of the ends are sewn in and it needs blocking but the light was fading fast as I finished it and I wanted to get some quick snaps. I'm glad I went with this over a cowl as it's more versatile but can still be worn tied at the neck for the cowl effect. Oh and I also learned to do "wrap and turn"/short rows and did my first KFBF (knit into the front, back and front again) for this project too. It's very pleasing. In other yarny news, I have finally succumbed to the Hexipuff bandwagon and downloaded The Beekeeper's Quilt. I've been seeing this on my virtual travels for a little while now, and added it to my queue some time ago, but it was the video on 'Tiny Owl Knits' that finally sold me. If you've never seen Stephanie, she is that kind of kooky-crazy I find to be completely engaging, and I adore her other patterns, so I am sure there will be a few more popping up on these pages. The DPNs are ordered, I have some sock yarn scraps and lots of toy filling at the ready. I'll be giving my first 'puff' a bash in the next few days, although I'm going to have this as a handbag project so it'll take a long while! I have finally succumbed to the Hexi-Puff craze too. I made a bag for a few people last week for their hexis and somehow ended up downloading the pattern. I love the hat, it's really cute, and your cowl is gorgeous! I love the Beekeeper's quilt - I found it a couple of weeks ago and was really jealous that I couldn't knit, lol. I found the crochet version on Ravelry yesterday though, yay! Can't wait to see yours finished! 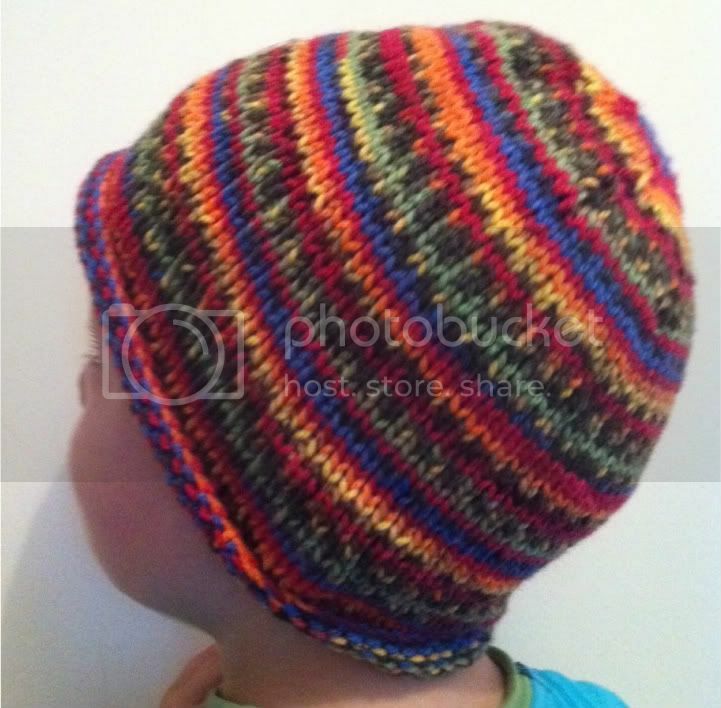 Loving your boys finished hat, the colours are gorgeous. Funny you say about the beekeepers quilt as I think I have seen three refs to it only this evening. Looks like you have got a lot done despite everything not being rosey, hope your next week is a lot better! I can't view the pictures here on your blog, but I can from the links. The pink ruffle is so pretty and Little Miss is so radiant in it. Your son's hat came out wonderfully! He must adore it as he was the one who chose the yarn right? Oh those sweet faces!! Love the hat and scarf. Great FOs and gorgeous kiddies! The look very mischievous! Sarah, I love both of your projects, but I really adore the scarf - I have had that in my favourites for ages and I might just have to move it to my queue. Can't wait to see your hexapuffs - I'm hexapuff challenged! Adorable scarf and hat, LOL at Rastamouse! I'm sorry that you've had a rough week, hopefully you'll have a great holiday weekend to make up for it. Looking forward to seeing how your BeeKeeper's quilt grows. That one is so so pretty! Love that hat, it's perfect. Beautiful scarf as well. I love the hat as well, it's perfect for a boy. The cowl has come out fantastic. 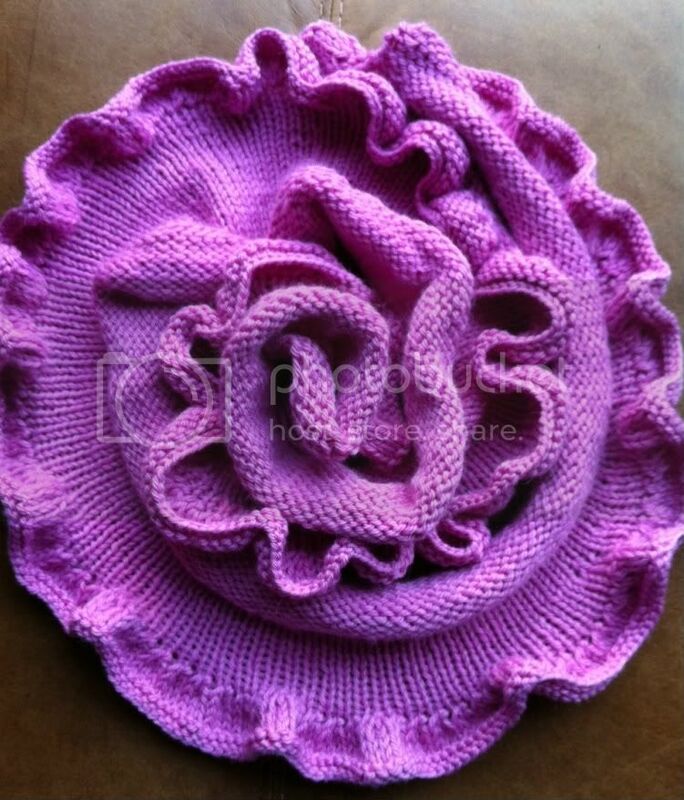 What a really pretty, quick knit. 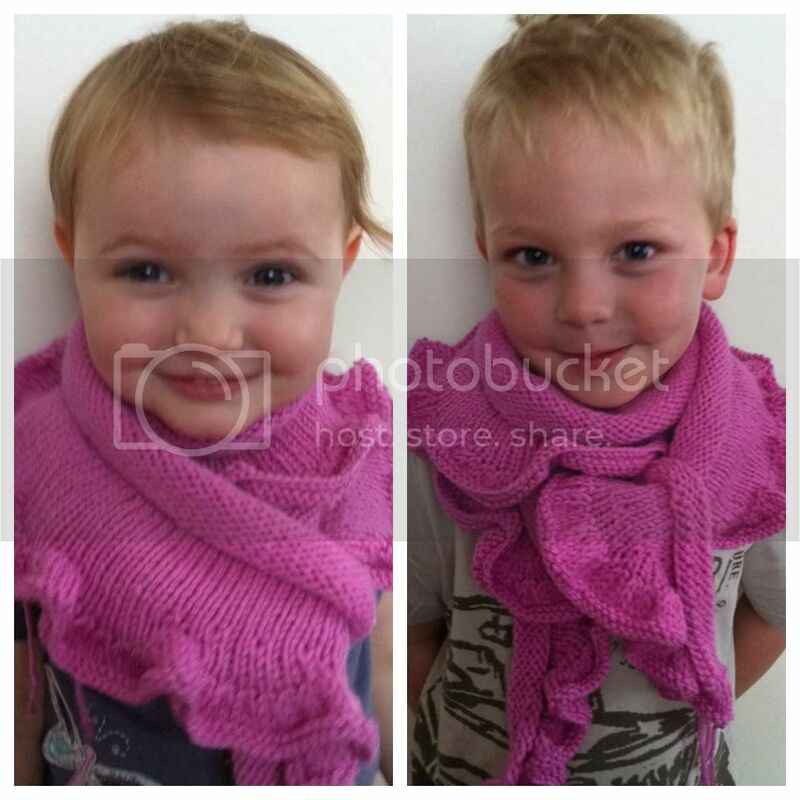 The pink cowl is beautiful, perfect for you little miss. Love both - especially the color of the scarf! Your little models are quite adorable!! Fabulous models! I love the hat - what great colors. Both projects are fabulous and very nicely modeled, too. I love the pink color of the scarf. The Beekeeper's Quilt is such a cool project. I have been thinking of starting one, too. Have fun in Wales! that beekeepers quilt idea is gorgeous - it might have found its way into my wish-list....! I, too, felt completely enamored by the beekeeper quilt's video and pattern and the only reason I didn't get the pattern was because I didn't have enough scrap sock yarn and didn't want to tempt myself to buy more. I'm excited to see yours! !